Sub-Title: How to immediately get into an argument with your otherwise very reasonable cop and firefighter friends. Like many people, I have lots of cop and firefighter friends and several other friends that otherwise work in city or state job. One thing I always approach with some trepidation is the subject of retirement pay for public workers. I mean, who wants to say that cops and firefighters shouldn’t have a nice, generous retirement after serving their community for many years? But the subject does have a way of coming up pretty often, especially when we hear story after story of cities going broke over public pension plans. Before getting into the actual retirement pay that public workers get, it is important to note that many retirement plans for public workers enable them to receive a percentage of their full-time pay as their ongoing retirement pay. For example, a worker may have an arrangement in which they receive 70% of their highest wage year. Since they have been working for many years and have seniority and often management positions that offer higher pay than when they are younger, their last year is often their highest paying year. And it is a common practice for many public workers to work overtime on their last year to bump that last year or two of salary even higher to maximize their retirement pay. An interesting article in the Wall Street Journal highlights the end result of this practice. The actuarial fact is that if a worker starts working at 22 as a firefighter and retires after 30 years at the age of 52, then they are most likely going to be receiving retirement pay for about another 20-25 years. If they are receiving 70,000 a year in retirement pay, then multiply that by 20 years and you will see that they could potentially receive up to $1.4 million in retirement pay. So basically, every public worker that works that many years and is able to game the system to maximize their last year or two of salary effectively wins the lottery. So each year, as more people retire, a city racks up even more recurring debt. Taxes can only be raised so high before you get a diminishing return (i.e. individuals and businesses tell you what you can do with your taxes and move elsewhere.) And yet public unions have been coming to city leaders each contract renewal time, wanting more and more, like some sort of less-than-polite Oliver Twist. No doubt the city leaders knew their cities could not inevitably support more but they also knew that they’d be long gone before some successor had to address the issue. If you mention that pension plans are one of the largest reasons for cities going broke, your union friends will often say that is not the case. They will say that it is bad management or something along the line of “They have the money but they’re wasting it on other things.” While it is true that spending priorities vary from city to city and there is obviously some waste, there is no denying that pensions are a huge reason for many cities poor financial state. Houston, TX for example, our country’s fourth largest city, reports pensions account for 11 percent of their $2 billion budget, up from 6.9 percent ten years ago. In San Jose, CA, the tenth largest city in the country, pension costs are 20 percent of their $1.2 billion budget, up from 9 percent in 2004. These increases are unsustainable. So now we see situations arise all over the country in which public workers “want what they were promised” while city leaders explain to them they were promised too much and explain to angry citizens why their cities are going broke. Different cities around the country are handling the situation in a variety of ways. In those states where union support is strong, cities leaders often do nothing and several, including Detroit, Michigan, have declared bankruptcy as a means of implementing the otherwise politically non-negotiable option of pension reform. The reality is that public workers are going to have accept retirement plans that are more in line with those offered by private businesses. And many already do. But those areas of the country that lack the public will for reform of pension plans that have been negotiated by unions will continue to see their cities financial state degrade. 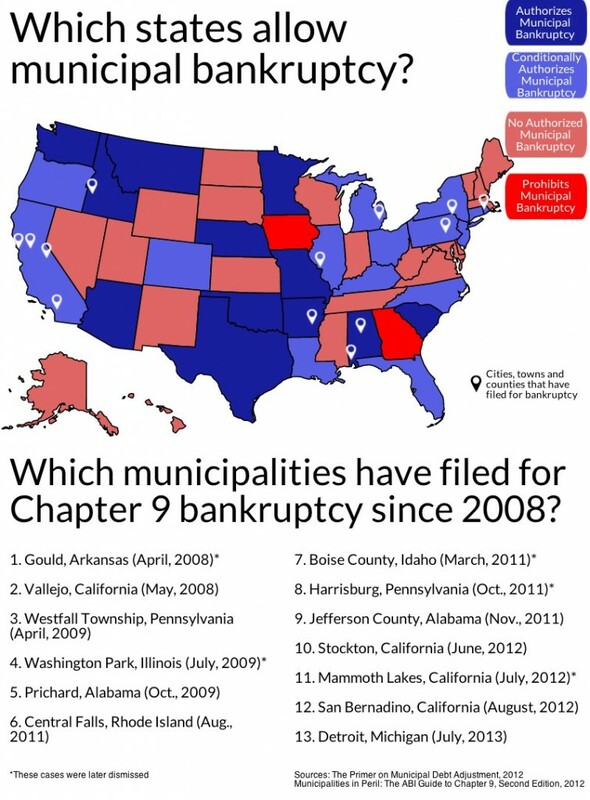 At some point, each city will be forced to do so or declare bankruptcy. So as you carefully have that conversation with your cop or firefighter friend about their retirement, be forewarned that being correct in your assessment of the lack of sustainability of their pension plans will not help you. They are great friends but they “want what they were promised” and resent cities “changing the rules mid-stream” and no blunt truth is going to change their mind. And you’ll probably end up nodding your head in agreement that those who risk their lives throughout their career serving their communities deserve a good retirement. Do so, change the subject like so many city leaders have in the past and order another drink for them on your tab. Then remind yourself not to have another talk with your friend the firefighter or the cop about their retirement plan being unsustainable.